(unopened) plate (probably IX) showing a geometrical projection of a ship designed on the wave-principle, showing the manner in which the wave-lines may be rigidly preserved in combination with other points which give good qualities to a ship. 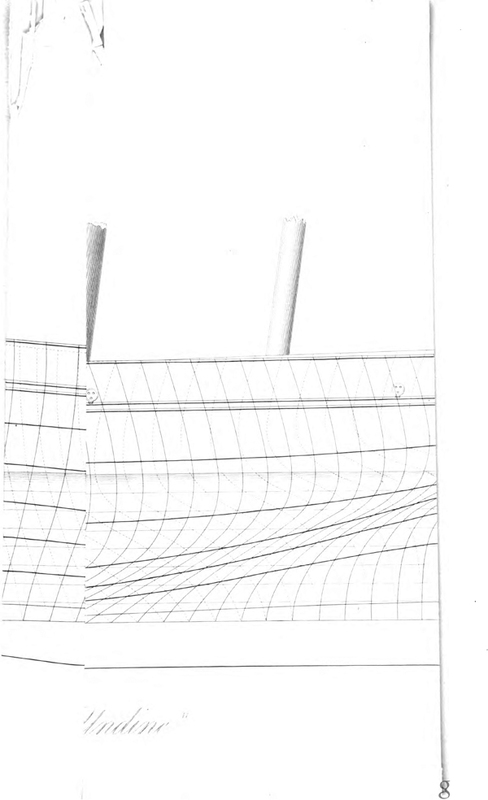 ex J. Scott Russell, The Wave-Line Principle of Ship-Construction, in Transactions of the Institution of Naval Architects I (1860); Google scan here. Encountered whilst searching dry practical details (which phrase appears in another contribution, same volume). John Scott Russell (1808-82, *) was a mathematically inclined shipbuilder (built the Great Eastern for Isambard Kingdom Brunel, for example). He discovered what he termed The Wave of Translation, now known by the expression soliton — a self-reinforcing solitary wave that maintains its shape while it travels at constant speed… caused by cancellation of nonlinear and dispersive effects in the medium. An earlier exposition (containing beautiful figures and plates) was his Report of the Committee on Waves to the Annual Meeting of the British Association for the Advancement of Science 6 (1837-8, *), and separately published as the Report on Waves (1845, *). and how their places are in turn supplied.